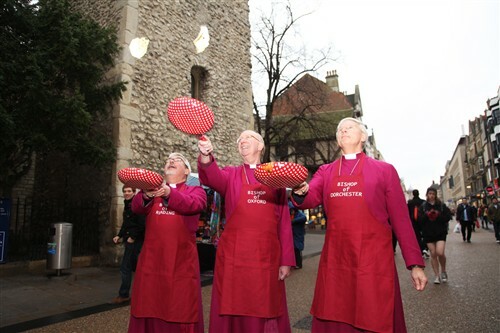 The Bishops of Oxford, Reading and Dorchester cooked up a storm when they make pancakes ‘al fresco’ in Oxford City Centre for Shrove Tuesday. The three Bishops served pancakes to passing shoppers outside St Michael at the Northgate in Cornmarket as a way of marking ‘Pancake Day’. h Wednesday. In Lent, Christians remember the sufferings of Jesus who he spent 40 days and 40 nights in the wilderness without anything to eat or drink. Traditionally people enjoy pancakes as a way of using up some of the rich foods – such as butter and eggs – that they gave up during Lent. The Bishops also gave shoppers a small card that explains the significance of pancakes as a Christian tradition. The card points people to a website (www.shrovetuesday.org) which explains more about the significance of Lent and Easter. The cards were being given out in churches and schools across the Diocese of Oxford, which covers Oxfordshire, Berkshire and Buckinghamshire. The pancake giveaway is the latest in the series of seasonal giveaways, which have in the past included hot cross buns, mini Easter eggs, mince pies and chocolate coins.